While it is considered the yoga capital of the world, Rishikesh may be best known as the home of the ashram where the Beatles (and other celebrities) spent some time in 1960s and where they wrote much of their White Album. 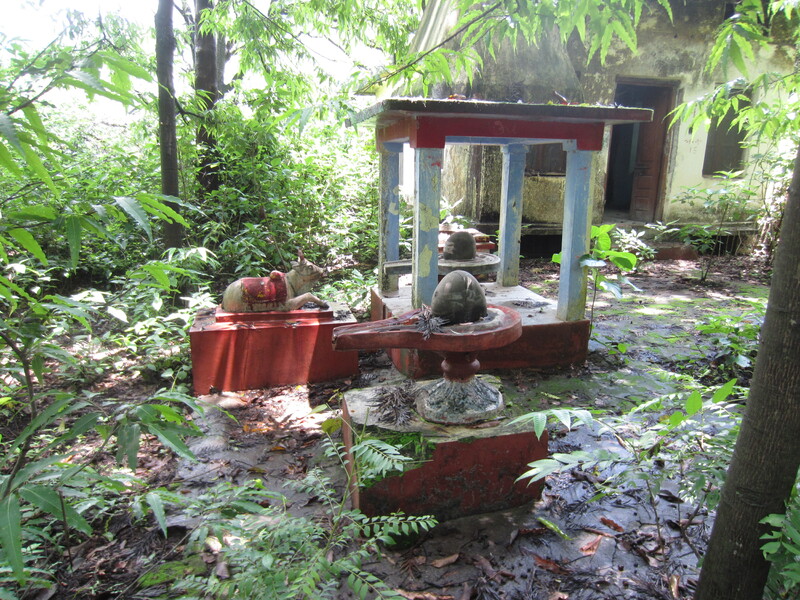 Though it is now-abandoned, the Maharishi Mahesh Yogi Ashram is still accessible to visitors, if you know how to get there. Aside from being diligent little yogis-in-training, many of my classmates were also quite musical, so of course had to check this place out! (and even if you’re not musical, who seriously doesn’t like the Beatles?). 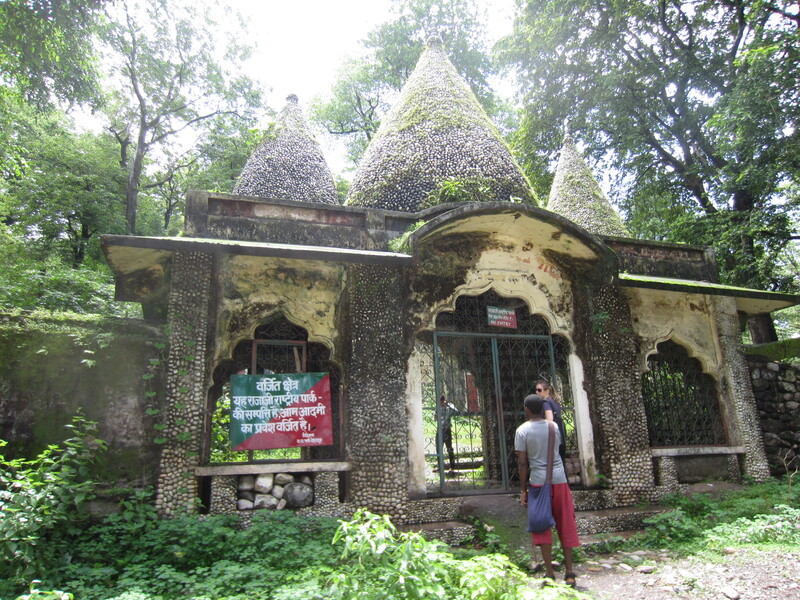 With vague instructions and water bottles, six of us headed out to an isolated forested area outside the main village of Laxman Jhula in Rishikesh, eventually stumbling upon the gates of a tall stone structure marked by three pointed domes covered in individual stones. Though the ashram is abandoned, the park authorities who own the grounds still charge 50 rupees (about a dollar) to enter the place, though once there you’re pretty much on your own. We entered through the gate to find a mostly forested area of lush green trees, spotted with crumbling stone dorms and lecture halls that were slowly being reclaimed by the forest around it. Despite a handful of other travelers, there weren’t many people at the ashram and we basically had the place to ourselves. Every now and then, a random Hindu statue of a bull or yoni/lingham illustrated the grounds were once a place of spirituality and religion, though there were no other markings to confirm where exactly we were or what we were looking at. Perhaps the most interesting part of the ashram was discovering the vibrant Beatles Cathedral Gallery, the only evidence we found on the grounds recognizing the ashram’s spiritual and musical influence on the world. Located in an abandoned hall within the grounds, the Beatles Cathedral Gallery is a colorful open space full of images of love and peace. 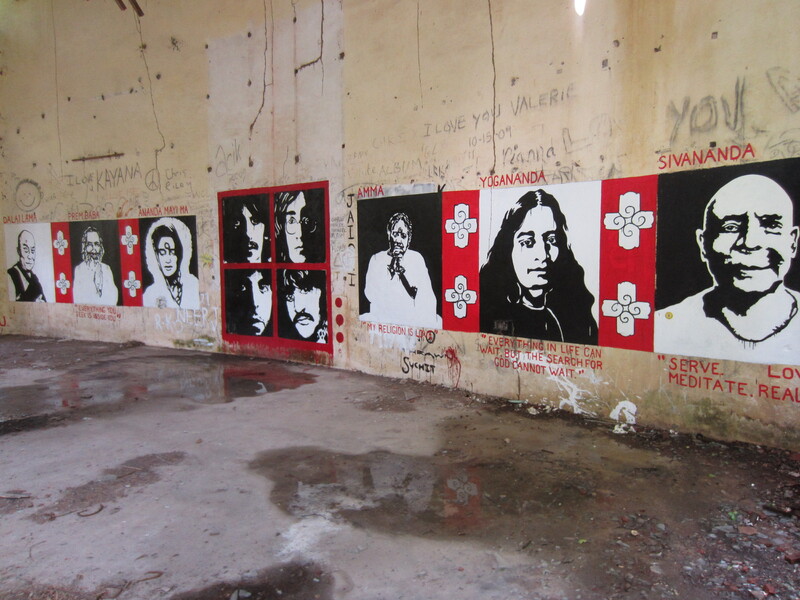 On one side, a series of spiritual leaders crossed the wall horizontally, painted in shades of black, white and red, including images of the Dalai Llama, Sri Prem Baba, Ananda Mayi Ma, Amma, Yogananda and Swami Sivananda, with an image of the Beatles dominating in the center. 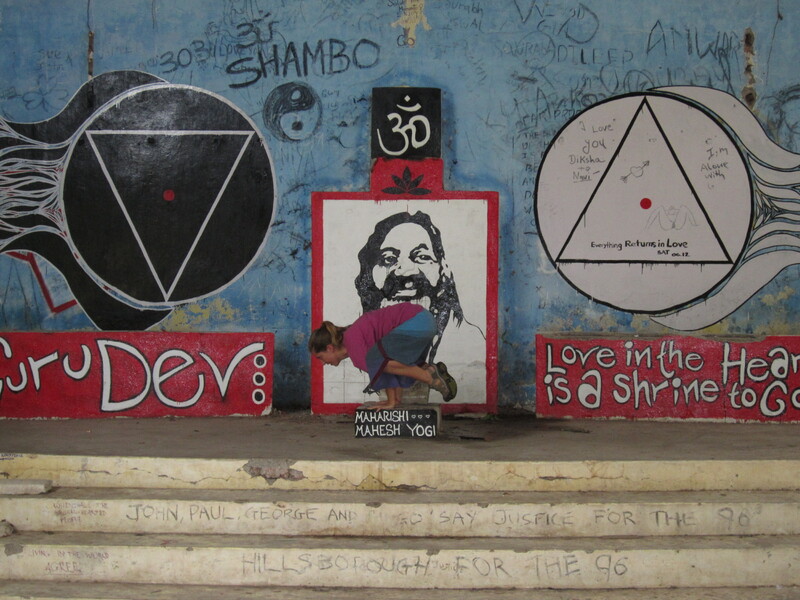 Directly across in the front of the room was another mural, this time, featuring an image of Maharishi Mahesh Yogi painted in black, white and red like the others, but positioned by himself on a blue background underneath an om symbol. Two large circles, one white, one black with opposite facing triangles, were painted next to the Maharishi, with images of wind-like trails flowing from either side. Our story is one of transformation. Together we witnessed the force of alchemy as this abandoned, sacred place regained its roots. Our story illustrates the lila between surrender and rebellion. This work is entirely illegal and entirely holy. Our story is one of growth. In this hall, one artist became an art director. Within these walls, one group of backpackers became first a community, then a sangha. We are painters, musicians, writers, sculptors, daughters, sons, lovers, bhaktas, rebels, renegades, strangers, yogis and friends. This is our gallery. This is our cathedral. This is our home. This is our satsang hall. This is our story. You are part of it now. Thank you to Maharishi Mahesh Yogi. Thank you to the Beatles. Thank you to Pan Trinity Das. Thank you to our gurus. Thank you to the birds. Thank you to the sadhus. Thank you to this place. May all be welcome here. May you love, may you create, may you inspire. May all beings in all realms be happy and free. From what I read later, the projected was apparently created by a group of volunteers in April of 2012 but closed down by park authorities only two weeks later. When I was there, it still served as a popular destination and was full of graffiti of words of love and peace from visitors from around the world. Inspired by the musical energy, we then relocated to the top of another building inside one of its rooftop cells for an impromptu sing-a-long and chanting session, taking advantage of the ashram’s spiritual energy and acoustics. As cheesy as it sounds, singing on top of the Beatles ashram in the middle of the forest with friends was a pretty magical experience and definitely one of the coolest moments of my time in Rishikesh. Here’s a slideshow of some additional photos of the Beatles ashram below. 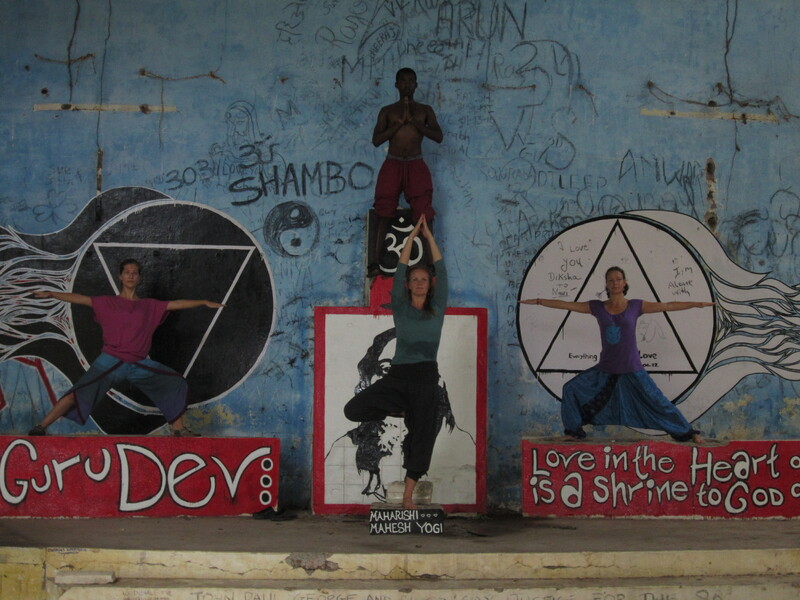 Amazing photos, thanks for sharing – definitely on my list next time I’m in Rishikesh! All the best for your future travels! Thanks, Andrea! It’s definitely worth a visit! Hi Deer Hunter. Apologies for the late response. I’m back at home now, so the blog is kind of finished (for now?) until I find a way to take off again :). Things may change in the next couple months, so maybe guest blogging then? Staytuned :).